I love that this house has a front porch because I love the idea of sitting out there for lunch, or sipping lemonade and reading magazines… it seems like such a lovely thing to do. First we would need a table and some chairs though. I went to IKEA (one of many, many excursions by now) to look for a table. I picked up two of the drop-leaf Muddus tables. They’re nice because they’re: a.) red b.) cute c.) flexible d.) did I mention they were red and cute? I waited for chairs because I buy way too many things at IKEA and I thought that maybe I could find some cute vintage wire chairs. Yeah. Except in the summer, everyone else is looking for cute vintage wire chairs, and the prices are adjusted accordingly. Back to IKEA I went, and I bought four white folding chairs (they were with the outdoor stuff, so they should be OK outside). The two tables seemed kind of like they were just slapped together (um, not that they were or anything…), so I picked up a little table runner to unify them. Then I got a little kooky. You know those big tissue paper fluff balls everyone’s been making? I kept seeing them in people’s flickr photos, so I picked up a kit (they’re by Martha Stewart for Michael’s). I thought I’d hang them over the bed, but then I thought they’d look sooo good outside. Maybe my neighbors will not agree. I may take them down. I hung a few paper lanterns out there too, and the space is so pretty at night. And you know what? It IS nice to sit out there for lunch, or to read magazines… or sometimes both! I know – CRAZY, right? I’m living la vida loca, for sure. where did you get the super cute white planters?? 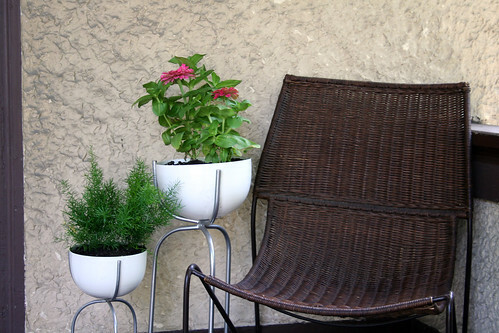 maybe you said and i missed it….i’ve been looking for some clean, modern planters like that and have come up empty handed! The planters were from CB2. They were pretty inexpensive ($10 for the small and $15 for the large). So cute! I love the idea of using the table runner to unify the tables. I might steal that idea. I love the funky water can, the gnome and the lanterns. I really, really love the planters and may also steal that idea. I had been looking at architectural vessels that were horribly priced! Sorry, honey, I don’t really like the fluff balls. I think I would like them somewhere else. However, maybe they look really cute at night. Whenever I decorate, I go over the top and then edit out about half (which I think I mentioned in regard to your dining room cabinet). These would definitely be edited during final polish. Great creativity, but creativity needs to be tempered with a teensy bit of restraint. Not easy for a creative type as you know. It’s kinda like painting, I feel like sometimes I need someone to pull me away from a canvas when it is done. I have overdone canvases before. So think of yourself as a painter and I am pulling you away because you are done. Edit those. I’m sure you’ll find somewhere else for them. Or they may be appropriate for a special occasion. Are those lanterns paper? I would move those to where the puff balls are. Where they are right now, they will get damaged by wind or rain. I love that wicker chair so much. The puff balls are lots of fun – if you love ’em then keep ’em. It all looks great! I’ve been thinking that we need to do something with our front porch as well, but I haven’t really had a vision for how I want it to all look when I’m done, so I do nothing. I hear you about not being able to find good porch/patio furniture during the summer. Even our local ikea is TOTALLY sold out of outdoor stuff! oh! I am so jealous of your porch. I love it all! I love the front porch and the little fluff balls are very cute! oh, your porch looks so lovely! I was thinking of getting the same red table for my patio. I am in love with the red & white. 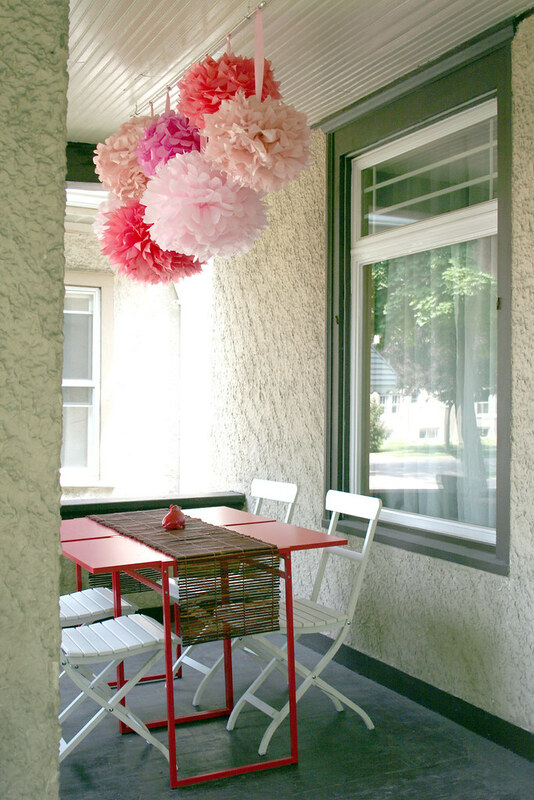 i hosted a bridal shower recently and we made these pom poms, too (pics in blog). Oh no! Dont take the pom poms down… they look great! The whole place looks fantastic. A drink in hand and this would be a hard place to leave! Great job. Also wanted to let you know I tagged you on my blog (check it out for what that means). I hope you don’t mind. Have a great day. I saw the picture of your porch somwhere else recently! I love the puffs. You MUST keep them! I love the fluff balls and plan on making some myself. I don’t think they’re right with the round paper lanterns, though. So, as for durability — how about making them out of plastic grocery bags? Couldn’t get the pretty pinks then… hm. But wait, aren’t there dyes for plastic? I love this! The combination of red and white is so fresh and comfy. 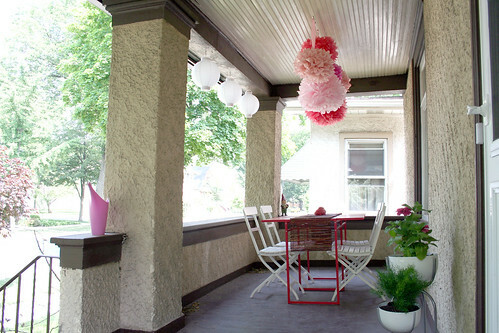 I cannot wait for spring so I can revitalize my little porch area. This past week’s sunny weather has me ready. Found your site through YHL and I really like your site too! I love your porch, and I’m not sure if anyone mentioned it, but I guess the only thing I would be afraid about is if it rains—those tissue paper balls will not be a fun thing to deal with. Just something to keep in mind I guess. As for the neighbors possibly not liking them—um, when do they get a say in how you decorate your house? It’s not like you have a beat up couch and an almond colored oven from 1975 with the door hanging off sitting out there ;) HAHA I think you’ll be just fine! If I was your neighbor I’d be coming over to tell you I love them! Adorable. Simply Sweet. Indeed, you have made it lovely! I’ve got your blog on my blog roll list and I’m delighted to do so! I agree…the puffballs are adorable. Life is simply too short to not surround yourself with things that make you smile! 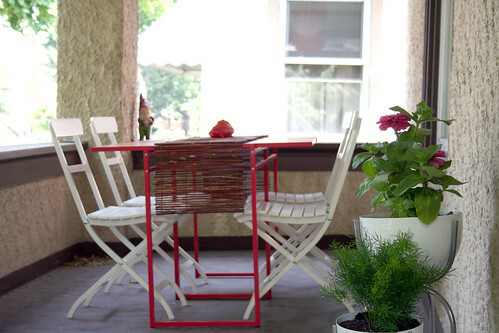 I also live in a house that is over 100 years old and it is a challenge to keep it fresh looking and of this century. I like your bold design moves. It takes courage to bring modern into old and you are doing it well. Thanks for the inspiration as always.